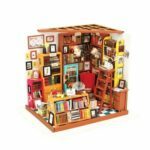 The DIY Dollhouse is ideal and creative gift to surprise friends, family and lovers. 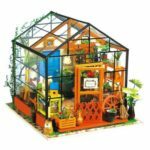 It is a great way to spend time with your child to work out this project. Stimulate children’s brain developments, help children improve ability to recognize things. 100% brand new and high quality, safe and environmental friendly, no thread to your health and safety. Build it yourself, improve the practical ability. Kids will gain confidence and happiness through their own work. 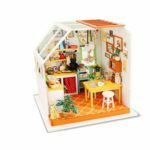 This apartment doll house features a bedroom, a washroom, a living room, a kitchen a pool and a car(random color), each part is vivid and cute, eye-catching and attractive for your room decoration. 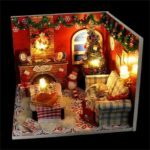 This apartment dollhouse need battery to work(not included), this romantic doll house features lights and music from The Flying Land, can create romantic atmosphere for your place. 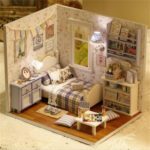 It is easy to assemble just need a little patience. 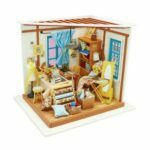 The package comes with scissor, tweezer, ruler, awl, white emulsion, screwdriver and art knife, you can assemble this doll house when you receive it. Have fun!